Princes in the Tower is a Renaissance musical trio comprising vocals, lute/cittern, drums and woodwind. 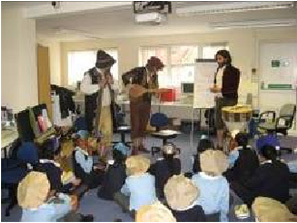 We deliver our Tudor Workshop in and around the London area with the emphasis on learning through fun and participation, with an eye on the National Curriculum. A demonstration of Tudor-era musical instruments is given followed by a discussion of life in Tudor England and the Tudor court. Pupils are taught a dance, to musical accompaniment, and the art of bowing culminating in an entertaining ‘Bow-off’. The relevance of songs in Tudor society is discussed as a living, historical conduit to the past. From our notes of the discussions, a song is written by the children, which is performed at the end of the session, with dancing and bowing. The Princes in the Tower have created an excellent Tudor workshop that combines many aspects of the National Curriculum with fun and excitement. It gives children of all abilities a chance to learn through active participation, and it captivates their imagination. 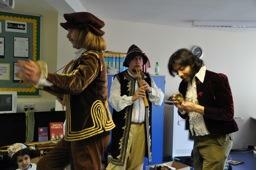 From their costumes to their instruments the Princes in the Tower offer an authentic and humorous Tudor experience. Sadly for them they only had one life. I wanted a son but I only had one. The Princes in the Tower gave an exuberant and informative workshop to Year 4, which had all the children engaged and focused on life at the court of Henry VIII. A unique and memorable opportunity! Thank you, Princes!